Lotus displayed their new Evora type 124 Endurance Racer, destined to be a factory entry in a few key endurance races over the next year. Continuing the racing theme: there was a special trackday type version of the Exige called the Cup 260. This is a 2010 update from previous models. With very strong rumours that Lotus will re-enter Formula 1 motor racing next season, with Malaysian backing, it’s good to see them pushing the race versions of their cars out to the general public. The memory of Lotus founder and enthusiastic race designer Colin Chapman’s racing heritage is still alive in the minds of car enthusiasts. 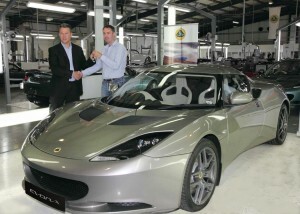 The standard Evora is now in full production and deliveries have started. Here’s a photo of the first customer car to be handed over at the Hethel factory in Norfolk, UK at the beginning of September 2009. 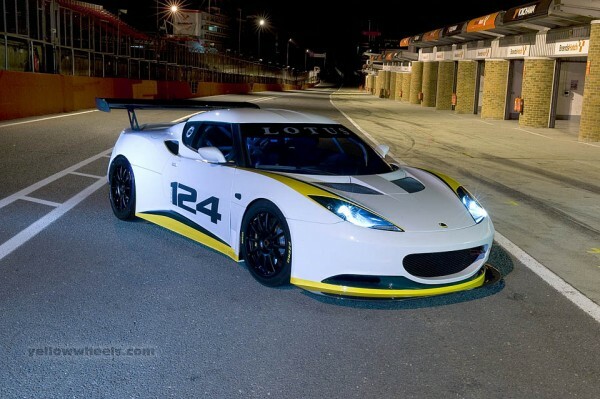 The Lotus Evora Type 124 Endurance Racecar has been developed from the award-winning Evora road car and is built to FIA regulations and safety standards. 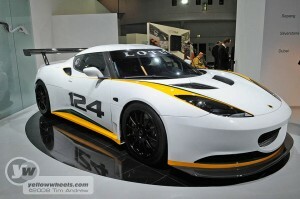 The Type 124 (pronounced One Twenty Four) Endurance Racecar is the next step in the evolution of the Evora. The car will make its 24 hour racing debut at the ADAC Nürburgring 24 Hours which provides a great test for the Evora’s performance, efficiency and durability under tough and demanding endurance race conditions. The racecar is fitted with AP Racing 6 piston callipers front and rear, with a race-tuned Bosch ABS system, 4-way adjustable dampers and adjustable anti-roll bars. The racecar runs on 18” rims shod with Pirelli racing slicks and the wheels widths have been increased over the roadcar to 9 ½ J on the front and 11 J on the rear. The racecar is expected to compete in a number of endurance races in 2010/ 2011 forming part of a factory-supported race program. The races that are targeted are: The 2010 ADAC Nürburgring 24 Hours (Nürburgring Nordschleife, Germany) in May 2010, Merdeka Millennium 12 Hours (Sepang, Malaysia) in August 2010, BritCar 24 Hours (Silverstone, UK) in October 2010 and the Dubai 24 Hours (Dubai Autodrome, UAE) January 2011. The track focussed homologated-for-the-road 2010 Model Year Lotus Exige Cup 260 takes design clues and technical innovations from the Lotus Exige GT3 racecar and combines with class leading emissions of just 199 g/km CO2 and exhilarating performance of 0-100 km/h in just 4.1 seconds. The Lotus Exige Cup has developed a cult following and a dedicated fan base since the first Lotus Exige Cup 240 was unveiled in 2006. Over the last 4 model years several hundred Exige Cup Cars have been sold, either specifically for race and track use or for a pure road going driving experience. 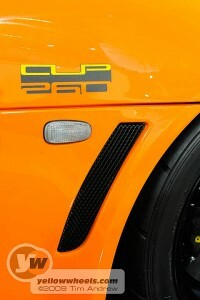 The latest Exige Cup 260, with 260 PS, takes the 38 kg weight savings introduced in the last years model, combines them with the extensive body and aerodynamic improvements and revisions introduced on the 2010 Exige in March 2009 and tops them off with new components and technologies to produce the most focused and pure Exige yet. The 2010 Model Year Exige Cup 260 is fully homologated for road use in Europe and key markets in Asia and North America – a must have for many race competition programmes where a road legal car has to be entered. 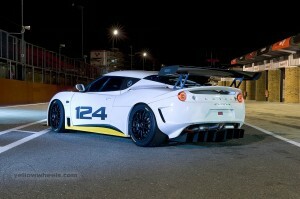 The Lotus Exige Cup 260 is also eligible to compete in the Lotus Cup Europe race series, organized and run by LoTRDC. The 2010 Model Year Exige Cup 260 takes the design and aerodynamic changes first introduced on the Exige S earlier this year to enhance the look and improve aerodynamic performance. The lightweight, unpainted carbon chord composite rear wing is based on the design from the Exige GT3 road car concept shown at the Geneva Motorshow in 2007. Compared to the 2009 Model Year Exige Cup 260 tailgate-mounted wing, it is 181 mm wider and mounted 46 mm higher and 61 mm further back. It is attached to the rear bodyshell clam via rear end plates which not only increases the stiffness of the whole structure but also ensures that as much of the airflow as possible passes over the rear wing. This careful airflow management increases stability, reduces drag and, most importantly, maintains the impressive downforce figures of 42 kg at 160 km/h. The restyled front end includes a larger, more angular air intake to help funnel more air through the radiator, to improve the efficiency of the engine. Ahead of the front wheels on either side of the main aperture, two larger air intakes increase the airflow to the twin oil coolers. Horizontal vanes, made from lightweight carbon fibre bisect these oil cooler air-intakes to stabilise the airflow to further increase the cooling efficiency. Mounted below the three air intakes is a new aerodynamic splitter for the 2010 Model Year Exige. Made from lightweight carbon chord composite, the splitter is extended to wrap around the whole of the front end and chiseled side lips are raised to deflect air around the tyres to reduce drag. The Exige Cup 260 now has an evolution of the rear diffuser and structural shear panel based on the version developed for the Exige GT3 race car, which increases the lateral stiffness of the rear subframe by 30% further enhancing its outstanding handling. The rear diffuser and structural shear panel links the subframe to the main chassis to give greatly increased lateral stiffness to the rear subframe suspension pickup points, resulting in better tyre contact patch control. This stiffness is also more applicable to those drivers who race or take part in track days using slick tyres that can also be fitted to the Exige Cup 260. Ohlins two-way adjustable dampers are now fitted as standard, adding even more personalisation of the driving characteristics so the driver can tune the Exige Cup 260 to their driving style and road or track conditions. A restyled front end and new larger, rear wing that not only reduces drag, but also gives a more muscular stance enhancing the lightweight shrink-wrapped look of the whole car. 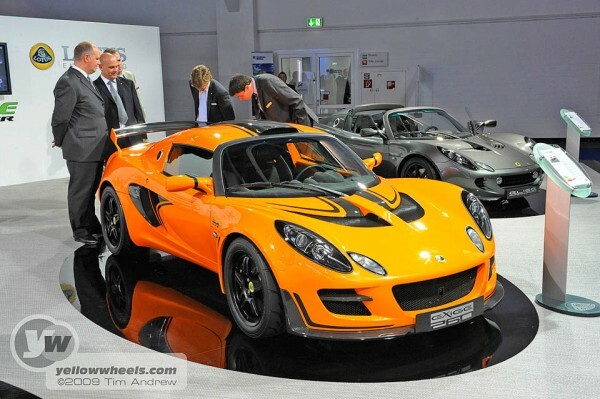 Like the 2010 Model Year Lotus Exige S, the 2010 Model Year Exige Cup 260 exploits the Lotus philosophy of using weight reduction to increase performance and reduce emissions. Fuel economy is impressive with an Official European Combined Cycle figure of 8.5 litres / 100 km (reduced from 9.1 litres / 100 km (combined) for the 2009 Model Year Exige Cup 260), a frugal 6.5 litres/100 km on the Official European Extra Urban Cycle and just 199 g/km of CO2 (reduced from 216 g/km of CO2 for the 2009 Model Year Exige Cup 260). Continuous engineering improvements over the last year including careful whole vehicle optimisation has enabled this sportscar to be even better for fuel economy and emissions. (* The seats are FIA compliant when fitted in conjunction with fixed seat runners that are available as a track only dealer fit option). Removing some other non essential components and equipment such as the interior and boot carpets, front mudflaps, battery cover, interior mirror, sunvisors, rear tailgate gas strut, results in a further weight saving of 4kg. The launch control allows the driver to determine the number of revs they wish to use during a standing start. Having programmed that limit, the driver then holds their foot down fully on the throttle pedal and sidesteps the clutch pedal for a very quick departure from the line. The clutch damper cushions the severity of the clutch to transmission engagement to minimise the stresses to the drivetrain. The launch control also keeps wheel-spin at bay until 10 km/h (6 mph), after which the traction control assumes its duties. All new Lotus Sport lightweight forged alloy wheels, thought to be the lightest original equipment wheels in the world, weigh just 5.65 kg (front) and 7.75 kg (rear). These ultra lightweight wheels reduce the unsprung mass therefore further improving the handling and contribute a weight saving of approximately 800 g over the already super light forged 2009 Model Year Exige Cup 260 wheels. The wheels are shod with Lotus specific LTS construction and compound Yokohama A048 tyres† to maximise grip and achieve the ride and handling targets set by Lotus engineers. † For GCC States Yokohama A048 LTS tyres are replaced with Toyo Proxes R888 tyres. Lotus Exige Cup 260 cars have the safety equipment expected of a race car, with FIA and HANS compliant carbon fibre lightweight sports seats*, normal 3-point “Webb Lock” harnesses (four or six point driver and passenger seat belt harnesses are available for track use only). A high tensile steel roll over hoop is now fitted with a body coloured Lotus Sport A-Frame as standard and the chassis is already pre-drilled to fit a full front roll cage – a simple dealer fit process involving just the removal of the roof panel for access prior to fitting. Completing the additional safety equipment is a FIA compliant electronic ignition kill switch, with cockpit and external activation, and a FIA compliant plumbed electrically activated fire extinguisher system, again with cockpit and external switches. 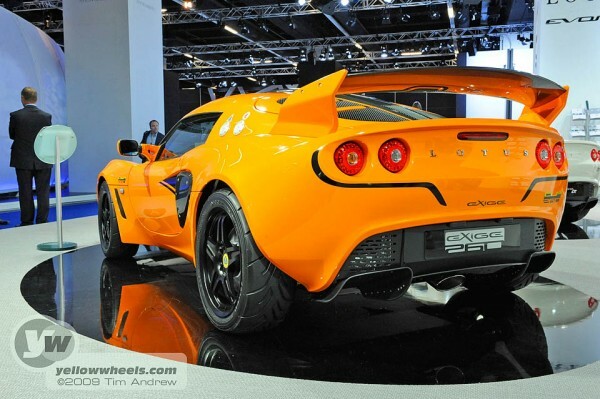 Like all current Lotus cars, the Exige Cup 260 is built around a very strong extruded and bonded aluminium chassis tub. Attached to the chassis is a sacrificial energy absorbing composite front structure designed to help absorb crash energy in the event of impact. To suit individual driving styles and road conditions, drivers will now be able to tune the Exige suspension with the Ohlins two-way adjustable dampers (which have 60 compression and 22 rebound settings) and ride height adjustment to reduce the ride height from 130 mm to 120 mm. An adjustable front anti-roll bar allows customers to tailor the handling characteristics of the car to their own requirements. As the Exige Cup 260 cars are equipped for track use, a double shear track control arm brace is provided to cope with the expected kerb abuse during track racing or hard track day driving. The brake system includes large diameter 308 mm 2-piece cross-drilled and ventilated front discs and 282 mm cross-drilled and ventilated discs at the rear, upgraded Pagid RS14 sports brake pads set into the brake calipers (AP Racing two piece radially mounted, 4 piston at the front and Brembo sliding at the rear), and stainless steel braided brake hoses – all linked to the proven Lotus track-tuned servo-assisted four-channel ABS system that enhances braking performance and minimizes stopping distance without taking over from the skill of the driver. The Exige Cup 260 is one of the quickest road cars around a circuit. Key to this incredible track performance is the aerodynamic package, which produces 42 kg of downforce at 160 km/h (100 mph) increasing grip and stability at higher speeds. With a top speed of circa 245 km/h (152 mph) and a zero to 160 km/h (100 mph) in circa 9.9 seconds, 0 to 100 km/h in circa 4.1 seconds (0 to 60 mph in circa 4 seconds), the MY2010 Exige Cup 260 is the perfect partner for the serious racer. Combined Fuel Consumption is 8.5 l/100km and the CO2 emissions 199 g/km. The supercharged and intercooled engine in the Exige Cup 260 has a maximum power output of 260 PS (257 hp) at 8000 rpm and a torque figure of 236 Nm (174 lbft) at 6000 rpm. This significant amount of extra power and torque now available together with the VVTL-i variable cam system ensures that there is a smooth and linear delivery of power from low engine speeds all the way to the maximum 8000 rpm (8500 rpm transient for 2 seconds). The Roots-type Eaton M62 supercharger (with a sealed-for-life internal mechanism meaning that it does not require the use of the engine’s oil) is run from the crankshaft and has an integral bypass valve for part load operation. Charge air (air under pressure from the supercharger) is cooled through an air-to-air intercooler (the air enters via the enhanced roof scoop) before being fed into the engine itself. All charge air ducting has been kept as short as possible with large diameter pipes to minimise restriction and maximise throttle response and efficiency. Four high capacity injectors and an uprated fuel pump add additional fuel under hard acceleration or continuous high speed driving – only on the track of course! A lightweight flywheel is fitted (giving even greater flexibility and response to the gear change), a sports-type clutch plate and heavy duty clutch cover transfer the engine power and torque to the lightweight C64 six-speed gearbox (with an aluminium casing) – with the same perfectly spaced ratios as the Exige S. A torque-sensing limited slip differential is fitted as standard, with a plate type limited slip differential available as an option. An Accusump (engine oil accumulator unit) is included in the whole package as an oil reservoir back-up for extreme track use ensuring that, under those conditions, the engine oil pressure remains constant. Electrical supply is provided by a lightweight motorsport battery which saves a massive 5 kg of weight sitting behind the rear axle – again weight saving is not just the removal of mass but ensuring that this mass is removed where it most affects performance and handling. The Lotus Sport Exige Cup 260 has a high flow, full-length carbon roof scoop as part of the lightweight carbon roof panel, which not only saves 4 kg but also ensures efficient cooling through the intercooler, which in turn allows the Exige Cup 260 to gain a higher charge density in the cylinders improving efficiency further. The standard specification Lotus Exige Cup 260 is road legal within the European Union, and can be registered for road use. Recommended retail price (including VAT) is £45,000, (an additional £950 is charged for on the road costs. These include delivery, PDI, first service, number plates, first registration fee, valet, 12 months Road Fund Licence and a full tank of fuel. The Lotus Exige Cup 260 will have a limited manufacturer’s warranty. The manufacturer’s warranty will be void if the car has ever been used on road or on track with “slick” or equivalent racing tyres. If the launch control facility is utilized, the warranty on related powertrain components is void. Clutch assembly and brake discs are excluded from the manufacturer’s warranty. The manufacturer’s warranty will not apply to any car which is subjected to race or competition use including but not limited to timed runs or laps. Purchaser’s Statutory rights are not affected.